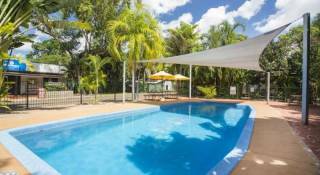 Accommodation in the Top End & Darwin, NT region. Book holiday houses and apartments for rent or browse towns for accommodation. 32 properties found in this region. Darwin is best known for its history that has endured many hardships and is on its way to establishing itself as the gateway to Asia. Darwin is situated on the edge of a harbour bigger than Sydney's and has become a beautiful, fascinating tropical city. The friendly laid-back lifestyle is attributed to its cultures and melting pot of people. 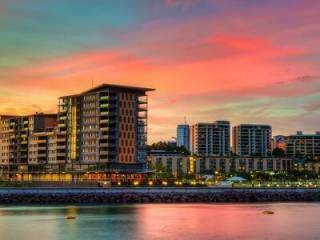 Darwin has become a sophisticated, modern city with a thriving hub of activity in terms of tourism with its world-class natural and cultural attractions, nightlife and retail. Visit World Heritage Listed Kakadu National Park with around 1,000 plant species, a quarter of all Australian freshwater fish species, and over one third of Australian bird species can be found in the Park. Cruise the Yellow Water Billabong or take a flight in the Tropical Summer (November – March) for a breathtaking view of Kakadu’s majestic Twin and Jim Jim waterfalls. Not to be missed is Litchfield National Park and is just only an hour-and-a-half drive from Darwin. Katherine is best known for the famous Katherine Gorge (Nitmiluk). With a rich indigenous and pioneering history Katherine and its surrounds are the place for great fishing and hidden natural wonders. 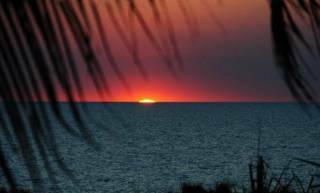 Katherine is around 300 kilometres south of Darwin and is set on the banks of the Katherine River. 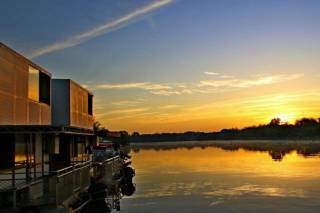 Cruise or canoe The Katherine River as it flows through 13 separate gorges. Swim between sheer cliffs to the sandy freshwater beaches of the main gorges, and view ancient Aboriginal rock paintings high on the rock faces. Highlights of the area include: waterfalls, rock pools, walking tracks, museums, art galleries, historic sites and character-filled pubs. Also within easy reach of Katherine include the Cutta Cutta Caves Nature Park, the Katherine Hot Springs and Edith Falls. Showing 1-75 out of 75 places found in this region. The Ultimate Weekender Package...any day of the week! We accommodate for large or small groups, with the option of a quad tour with Dundee Beach Quad Safaris. We are the gateway to the Finniss River, an amazing stretch of beaches ready to explore! 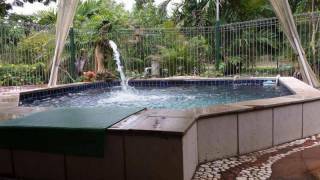 Large 3 air-conditioned elevated house with pool located only 50 meters from the best beach at Dundee beach. Location Location Location! House for holiday rental in Dundee Beach, NT. 150 metres to boat ramp and beach, 100 metre walk to the Lodge of Dundee. Mary River Wilderness Retreat located halfway between Darwin and Kakadu National Park. This eco-tourism property offers budget to deluxe accommodation, great facilities and a range of experiences. 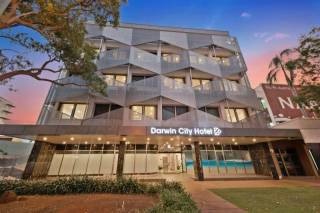 Darwin City Hotel is a 4 Star Boutique Hotel located in the heart of the CBD on Smith Street. We are a short stroll to the Mall, supermarkets and multiple restaurants, cafes and Darwin’s Waterfront District. 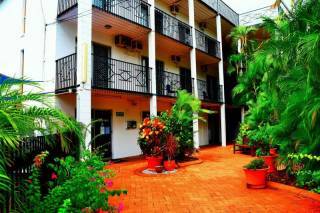 Darwin City Edge Motel and Suites is under new management and has recently undergone renovations and refurbishments. It has 60 air-conditioned, well furnished rooms, some with kitchenettes. Guest facilities include a swimming pool and BBQ area. THE BARRA SHACK AT DUNDEE BEACH - FISHERMANS PARADISE WITH PRIVATE BOATRAMP Discounts for all stays - let us know your dates. Spacious modern apartment. Large comfortable balcony ideal for dining in and relaxing and enjoying the evening seabrezzes. Quite location away from the hustle and bustle of the city. 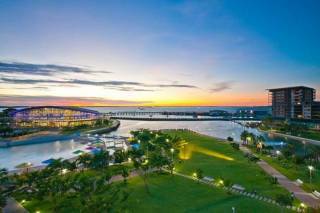 Situated in the heart of Darwin, Horizon 3 Bedroom at Waterfront Apartments is within an easy drive of Skycity Darwin. It is conveniently located for guests wanting to discover the area's attractions. Oceana is a modern high floor oceanfront spacious 3 bedroom apartment with 2 living areas (one with a double sofa bed). You will be amazed by the stunning ocean views and upmarket facilities. Also offers a tennis court, gym and pool. 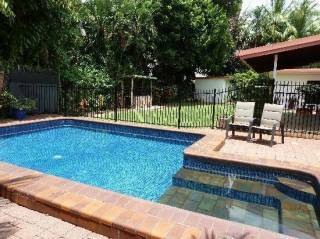 Darwin City Bed and Breakfast is a long established B&B close to the centre of Darwin, capital of Australia's Northern Territory. 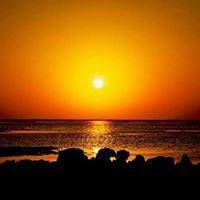 Comfortable and affordable accommodation with a personal touch, Darwin City Bed and Breakfast is your home away from home. 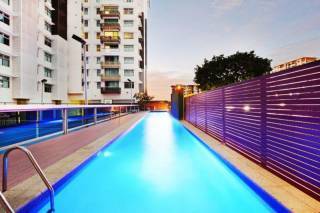 SPACIOUS HOLIDAY APARTMENT CLOSE TO DARWIN CBD! THE SECURE COMPLEX HAS A POOL AND THERE IS UNDERCOVER CAR PARKING.